Installing pavers in patios and walkways provides a more uniformed, man-made look than flagstones. Depending on the aesthetic of your home and garden, this can be the hardscape that unites your landscape design. 1. A solid plan is essential for a successful project. This will allow you to accurately calculate the amount material you will need. 2. Using graph paper, create a scaled drawing to map out your site, taking particular note of the structures in the area of your intended project. Be sure that you have included adequate drainage in your plans. 3. Contact your local utility company to make sure you will be digging in an area that is safe to excavate. 4. There are a variety of pavers to choose from. Select the materials that will best suit your budget as well as the aesthetic of your home and garden. 5. Order 5-10% more material than the square footage of the area you intend to pave. This will give you wiggle room when making necessary cuts. 6. Using stakes and string, map out your intended paving site. For irregular shaped sites, marking paint can be used to outline the intended paving area. When laying out your site, make sure that the finished project will slope away from buildings, allowing rainwater to run away, rather than towards, your home or any other structure that can be adversely affected by standing water. 7. 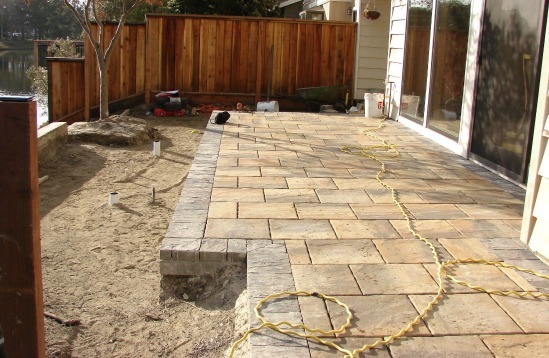 Dig out the area where you will be installing pavers. The area excavated should be about 6 to 12 inches deep. 8. Next, add a layer of base rock and then compact the area using a plate compactor. A hand tamper should be adequate for smaller areas. Wetting the base rock a little can help with the compacting process. Next add another layer of base rock, compact it, and then walk on it. When your foot no longer makes an indentation, you can add another layer, repeating the process. For patios and walkways, the base should be 4 inches thick once compacted. Driveways should be at least 8 inches thick. 9. Next, pour a 1-inch deep layer of sand over your compacted base rock. Level the surface with a level board, and then compact the sand. 10. Add a metal or plastic edging strip, which can be purchased at your local paving supply store. 11. Now start setting the pavers. Begin working in a corner, laying your materials out so that all the joints are in straight lines. 12. If you need to cut a paver, a hammer and chisel or diamond blade saw should be used. 13. 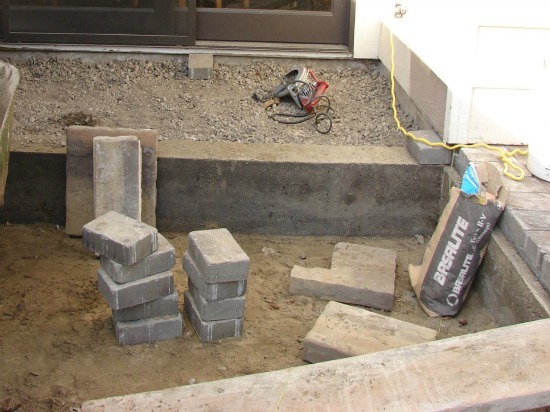 After installing pavers, use a plate compactor to firmly secure what you have laid down. 14. Add more sand or stabilizing material to thoroughly fill up the joints. Then, run your compactor over the area once more. 15. Finally, a sealant can be added to further protect your newly installed pavers. This will also give the area a cleaner more finished look.